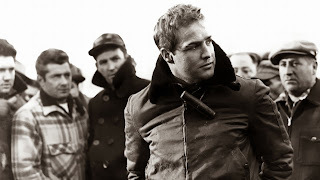 A masterpiece delving into union corruption and the power of the individual, On The Waterfront is a potent drama with a peerless Marlon Brando performance and an outstanding supporting cast. 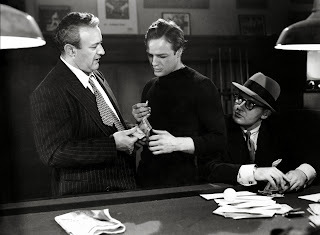 Union boss Johnny Friendly (Lee J. Cobb) rules his waterfront district by intimidation, lining his pockets by running rackets and relying on the working men adhering to the "D and D" (deaf and dumb) code of conduct. Terry Malloy (Brando) hovers on the outer circle of Friendly's circle of corruption, and unwittingly finds himself used to lure informant Joey Doyle to his death. Joey's sister Edie (Eva Marie Saint) demands that the perpetrators be identified and brought to justice, and she shames Father Barry (Karl Malden) into action: he tries to encourage the men into testifying, but Friendly's goons are quick to beat-up anyone who breaks the code of silence. Terry makes advances towards Edie, and gradually they become close, although she does not know that Terry had a role Joey's death. As more men are violently silenced, Terry is influenced by Edie and Father Barry, and starts to consider testifying against Friendly. But his brother Charley (Rod Steiger) is one of Friendly's closest associates, and turning against the union boss and his henchmen will carry a high personal cost. On The Waterfront carries the ominous tones of director Elia Kazan's own struggles. In 1952 he testified before the House Committee on Un-American Activities, naming names and identifying communist sympathizers from years past. In the movie, Terry Malloy is caught between doing what he is being told is the right thing to do, and loyalty to his "group", the organization of Johnny Friendly. Testifying against Friendly means betraying his friends and family, but remaining silent means letting down Edie and Father Barry, and allowing a rotten situation to get worse. Alternating between an emerging unlikely love and the power of the fist down at the docks, On The Waterfront is full of energy. Friendly and his goons run a tight ship, controlling who gets to work and who does not, who gets the cushy job and who gets to toil, all determined according to favours afforded and gained. The men chafe under a regime imposed by violence and facilitated by their own acquiescence. The Budd Schulberg script allows plenty of time for the romance between Edie and Terry to develop, and the measured pace contributes to the air of authenticity. Edie initially appears too good and too smart for Terry, and time is needed for her to find the charm and humanity within the self-described "bum". Once they start to care for each other, Edie offers a moral compass and a road to salvation, and Terry starts to understand that he may have something to gain by standing up for what is right. The film's beating heart is found in Terry's transformational journey from dim witted hanger-on to an inspirational leader of men. Brando is surrounded by the triangle of Cobb (loyalty), Steiger (family) and Malden (conscience), and the four actors create an electric dynamic. Brando is brutally brilliant as a man suddenly being pulled in three different directions at once, the bum-like tendencies of a boxer who long-since sold-out now overburdened by unfamiliar responsibilities and demands. Terry Malloy, speaking with his brother Charley: You don't understand. I coulda had class. I coulda been a contender. I coulda been somebody, instead of a bum, which is what I am. Cobb is all fiery rule-by-fear, while once awakened, Malden is a tentative force for pure good. It is left to Steiger to provide the most textured supporting performance, Charley smart enough to see the writing on the wall, but hoping that his brother would fully enter Friendly's fold before he can be convinced to testify. As much as Terry has a dilemma, Charley has a real problem, since he is all-in with Friendly and subject to potentially humiliating punishment should his brother talk. All four men were nominated for Academy Awards, with Brando receiving his first statue at the fourth attempt. Eva Marie Saint, in her film debut at age 30, also won the Academy Award as Best Supporting Actress. Her turn as Edie is tenacious in the pursuit of justice and enlightened enough to explore a relationship with Terry. 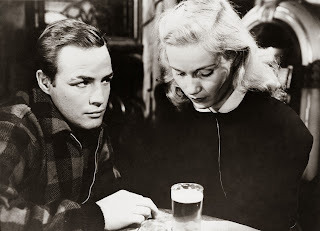 Filled with heart, sweat, agony, blood and triumph, On The Waterfront rocks the docks.